China's first novel delivered through SMS is being made into a film that will also be transmitted to cellphones and on the Internet, state media reported. The Taiwan-based company Bestis Technologies has bought the film rights to Outside The Fortress Besieged, a 4,200-character, 60-chapter novel that has been sent out to cellphone subscribers in short instalments, said Xinhua news agency. The film will consist of 30 to 40 segments and should be able to be viewed on cellphones, company officials said. Earlier, a Beijing-based wireless business operator bought the domestic rights to the novel for 180,000 yuan (US$36,700). The novel, written by ethnic Mongolian businessman He Xingnian, is a steamy tale of illicit love among married people and is being short-messaged in two daily instalments of 70 characters each. 'The word 'fortress' is a metaphor for marriage in Chinese. 'People on the inside want to get out. People on the outside want to get in, meaning having extramarital affairs,' said Mr He. In addition to providing the usual functions that are already commonplace in East Asia such as e-mail, web surfing, restaurant reservations, dating and global positioning-aided directions and maps for the lost, China's cellphone world has become the latest frontier of individual enterprise. 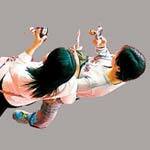 China has about 260 million cellphone users, the vast majority of whom use SMS, Xinhua reported. During the Chinese New Year period, cellphone users in China sent nearly 10 billion short messages, generating 1 billion yuan in revenue, it added.